It’s time to curl up by the fire with a big mug of hot chocolate, a plate of gingerbread and just read. 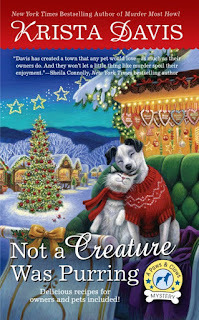 Plus, Krista Davis makes her contribution to our Seasons Readings by giving away a copy of Not a Creature was Purring! 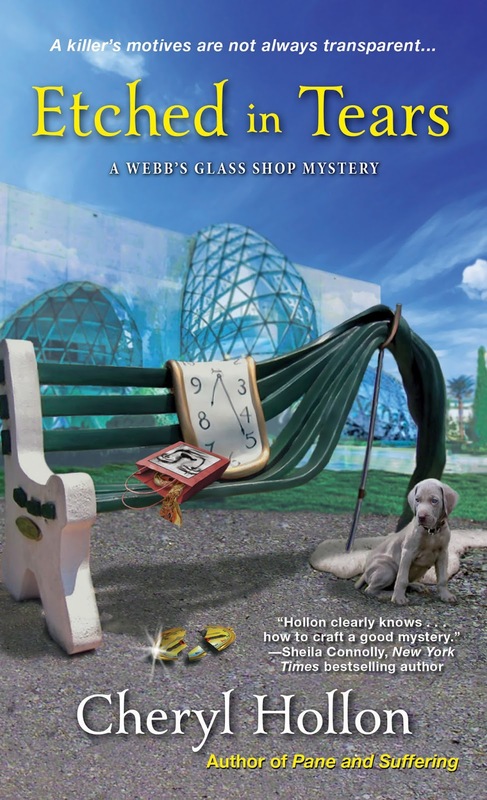 When a famous glass artist is murdered at his own exhibit, deadly secrets are put on display, and it’s up to glass shop owner Savannah Webb to see through a killer’s cover. Celebrated glass artist Dennis Lansing is returning to St. Petersburg, Florida, for an exhibit at the world-renowned Salvador Dali Museum. His unique style of embedding document images in his art is at the vanguard of contemporary glasswork. But as Savannah’s first boyfriend and a former apprentice to her father, Dennis’s return home has her reflecting on the past—a trip down memory lane that takes a dark turn when Dennis is found murdered at the museum with an old reference letter from her father in his pocket. A search through her father’s records sheds new light on Dennis’s history, but it seems his present life wasn’t so transparent either. Now, with a gallery of suspects to consider, it’s up to Savannah to figure out who fits the mold of a murderer. 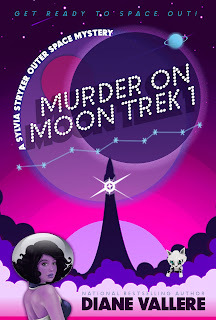 When space academy dropout Sylvia Stryker hacks her way into the position of Uniform Inventory Manager aboard the Moon Unit 5, she jumps at the chance to leave her small planet behind. Besides, who will find out she faked the results of her physical? But when the ship’s second navigation officer is found dead in the uniform closet shortly after departing the space station, Sylvia’s problems become bigger than falsified test results. And when her supervisor places her on probation for her own uniform infraction, she’s at risk of being dropped off at the nearest substation. 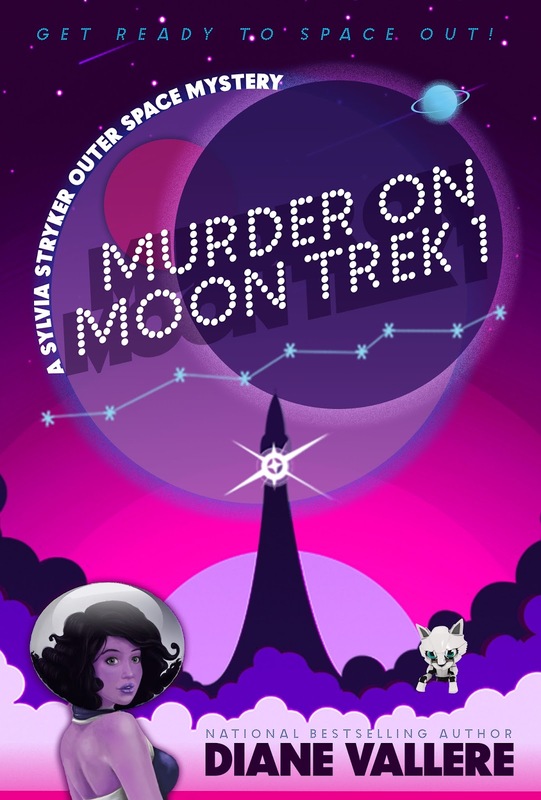 Juggling red shirts, white lies, and an army of little green men, Sylvia has to expose a killer before the Moon Unit 5 becomes space dust. 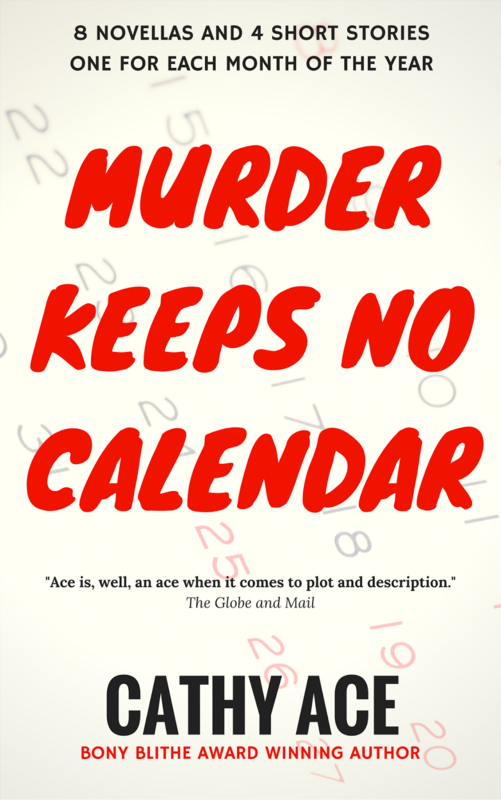 Eight novellas and four short stories - one for each month of the year, and all with something in common...MURDER! 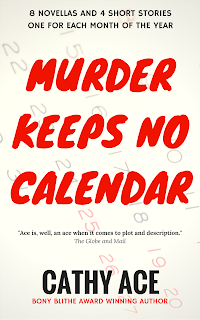 For those who already know Cathy Ace's characters Cait Morgan and Bud Anderson - or the women of the WISE Enquiries Agency - this collection will bring the delight of finding out how they met their 'significant others' and began their murderous adventures. If you're discovering this award-winning author for the first time, you're in for a treat...with twelve tales of intrigue and murder to enjoy. Taylor O’Brian is a new businesswoman, founder of “Taylor’s Off The Beaten Path Wine Tours,” who lives on a small winery with her Aunt Jemma. She plans to take small groups around romantic Sonoma county to discover some of the county’s outdoor gardens. It’s all running as smooth as can be until Laura, the leader of the group of yoga instructors she’s leading, is found dead. And it’s Taylor’s corkscrew that’s found buried in Laura’s neck. She’s not sure who to trust, and everyone around suddenly seems suspect. 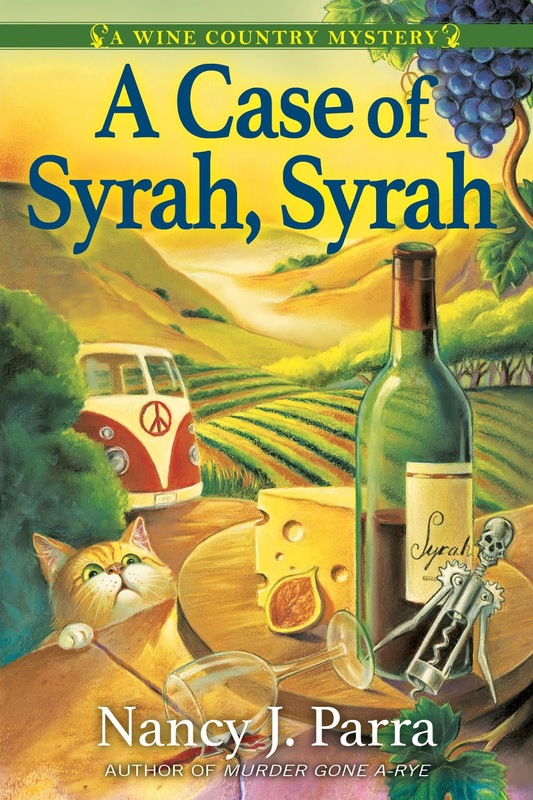 Only two weeks after the murder, her very own administrative assistant, Amy, marries Laura’s husband, Dan, who doesn’t seem very bereaved about being widowed, and the three yoga masters who were also out on the tour begin to seem shady. Taylor can’t afford to jump ship from her new business endeavor, but just as she begins her investigation, another dead body surfaces. This time, it’s Dan’s sister. And the killer is coming for Taylor next. Now it’s up to Taylor to uncork this open-bottle mystery, before more blood is spilled. 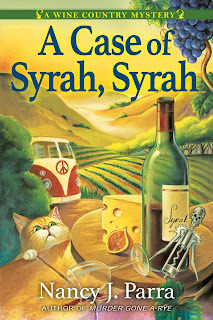 For fans of Laura Childs and Ellen Crosby, A Case of Syrah, Syrah is the charming first in bestselling author Nancy J. Parra’s Wine Country mysteries. Happy Holidays to all our readers from Krista Davis. Today's Seasons Readings giveaway is Not a Creature Was Purring. Please leave a comment with your email address to enter. Good luck! I'm so excited!! 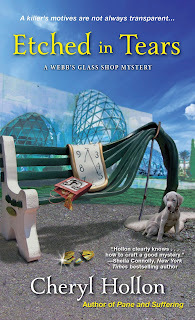 I've just started reading cozy mysteries and they are the BEST!! I stayed away from reading because there's nothing worse then opening a book only to read content you don't even want to hear. Mysteries are my favorite and I love twists and turns!! I also adore cats and Christmas so this will be my first one weather when it or not. LOL. Thanks for giving us the opportunity! More books for my TBR list. Etched in Tears looks good, and I always enjoy holiday-themed mysteries too. Christmas cozies are my "catnip" during the holiday season----I just can't resist them. The cat and dog on the cover of Not a Creature was Purring are just adorable. More books for my list. Happy Holidays to you as well. Some amazing books for me. Lot of great new books for December! Would really like to read "Not A Creature Was Purring", sounds like a great holiday read. I would greatly love to read each and every one of the books you mentioned. Thanks for the chance to win one of them - Not a Creature Was Purring. All of the releases sounds wonderful. TBR'd those not already on that list. Did not see Cathy's book there, though. And I noticed a couple of them had GR giveaways as well! WAHOO! luann(dot)braley(at)gmail(dot)com. What a great list of books. They all look good! There are just so many cozies to read. Thank you for offering your book as the giveaway Krista Davis. The series is on my TBR list. Merry Christmas! Christmas cozies are always so much fun... And this cover is absolutely adorable! Christmas Cozies are the best. They set the mood.Thank you for the contest. I love, love, love this series, and I know this would be a pawfect book to curl up with this holiday season. Can't wait to read it! My email is mlcreamer@hotmail.com.